I’ve only read three of the five books that I’ve set out to read for January but I did read two books that were carry-overs from last December and I am glad that I did because they turned out to be the really good ones. The Mountain Lion may be one of the most affecting coming-of-age-stories that I have ever read with one of the most memorable protagonist in recent memory. Georges Simenon’s Pietr the Latvian did introduce an intriguing character in the form of Detective Maigret but the plot was sub-par and filled with contrived scenarios. Time’s Arrow, hinged on a particular trick which is telling the story in reverse chronology, convinced me of Amis’ genius for it is certainly one of the most inventive books that I’ve ever read where the innovation didn’t hamper the progression of the story. The Case of the General’s Thumb started on a promising note but I felt that Andrey Kuryov’s narrative delved deeper and deeper into unnecessary over-complications though the two main protagonists were charming and interesting enough to glide the story to a satisfactory conclusion. Lastly, Cesar Aira’s Shantytown proves that you can never go wrong with Latin Americans. I was also supposed to read Raymond Chandler’s The Big Sleep and Xu Zechen’s Running Through Beijing but, well, stuff happened. It has becoming more and more apparent that this feature should be called Suggested Reading instead of Essential Reading but I stand defiant against accepting the fact that maybe I cannot finish the books that I set myself to read. 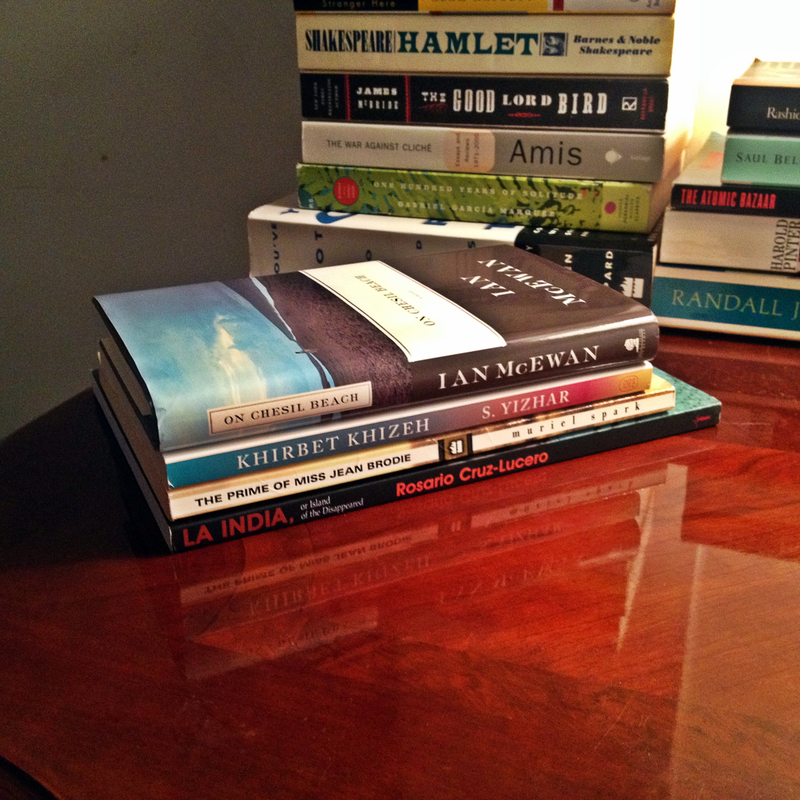 On Chesil Beach by Ian McEwan – I’m starting to love Ian McEwan bit by bit. He has proven that he can balance inventive writing with readability which I found out by reading Atonement and Sweet Tooth. On Chesil Beach will be the third novel of his that I am about to read and the plot alone, about a newlywed couple on their honeymoon where they discover things about themselves and their relationship, is enough to convince me that this will be another book that I will enjoy reading. Khirbet Khizeh by S. Yizhar – I saw an article in my Facebook feed a few weeks ago about how this book is being made available to an American audience for the first time since its publication in 1949. Admittedly, I do not know anything about the author but the plot very much intrigued me. It is a fictional depiction of how the residents of Khirbet Khizeh, a fictional Palestinian town, were expelled by Israeli forces during Israel’s War for Independence in 1948. The Prime of Miss Jean Brodie by Muriel Spark – For 2015, I pledged that I wanted to read more of Muriel Spark’s oeuvre and I’m going to start by reading her best known work. Full disclosure, I am now dead set in liking this because not only did I like one of her works, The Ballad of Peckham Rye, but also because I personally know someone who decided to condescendingly brand this book as chick lit just because it deals with women’s issues. Needless to say, I just want to prove this myopic individual wrong. La India, or Island of the Disappeared by Rosario Cruz-Lucero – I think this is the 2nd time that I am attempting to read this book and I hope I’ll be successful this time. I barely picked up this book on my last attempt but I did manage to read one story about a mapmaker in Negros and I was impressed. Also, I miss the Philippines and this might help alleviate my longing for my homeland. I’m also going to read TFG’s Book of the Month which is Loved Walked In by Marisa de los Santos but it is not pictured because the copy that I ordered from Powell’s is still in transit. Anyway, that’s my reading list for February. Until next time.